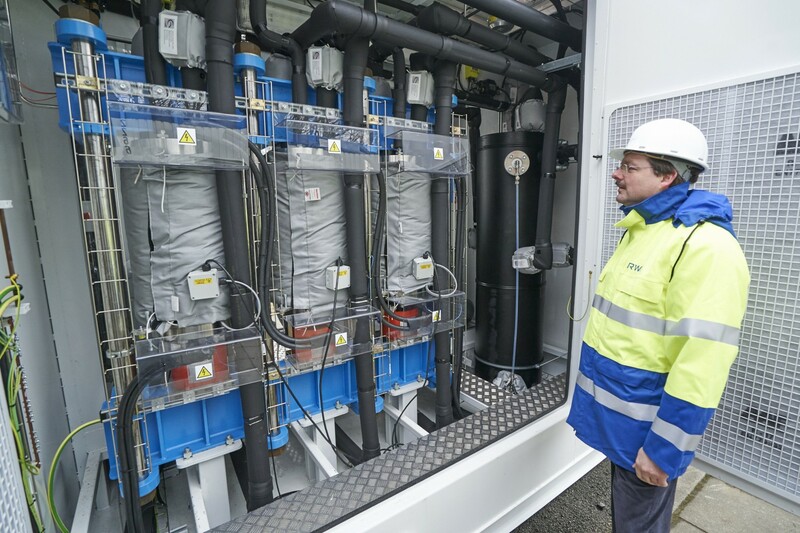 Electrolyzers convert water to hydrogen, consuming electricity in the process. The cells aren’t cheap as they require specialized materials, and you lose more than 30% of the energy in conversion. One energy storage concept is to store that hydrogen, then run it back through a fuel cell to convert the hydrogen directly to electricity. But this is expensive, since two stacks are needed (electrolyzer and fuel cell) and the round-trip efficiency is poor (70% electrolyzer x 50% fuel cell = 35% round trip at best). In addition, large high-pressure tank farms would be needed to store appreciable amounts of energy in the form of hydrogen. This is why storage in the natural gas network is appealing – the hydrogen can be injected in an effectively huge reservoir rather than stored in new tank farms, and there doesn’t need to be an expensive fuel cell stack at the other end to convert the hydrogen back into electricity. At low concentration, the existing infrastructure can be used without worrying about hydrogen leakage or explosive properties. It’s called “Power to Gas”. As an example, British manufacturer ITM Power is working on two such projects in Germany. Their earlier project could absorb 315 kW to produce 60 standard cubic meters of hydrogen per hour, mixing it in a 1:49 ratio with natural gas. The reported efficiency from electricity into hydrogen is very good – 65%-77% over the working range, not including DC to AC conversion – so they’ve got a good start. Canadian firm Hydrogenics has also been working on power-to-gas projects for years, recently working on several megawatt-scale projects. In order to make economic sense, the input price of the electricity has to be very cheap, and the resale value of the hydrogen has to be high. As a combustible fuel, hydrogen offers less energy per volume than natural gas. For example, assume 40% round-trip efficiency for surplus electricity fed into electrolysis, injection into the natural gas grid, and then conversion back to electricity in a gas turbine. That means the input electricity has to be bought at 4 cents and sold at 10 cents just to break even. The purchase price actually has to be even cheaper to provide margin to cover capital costs, O&M, etc. In other words, the price of electricity entering the electrolyzer has to be incredibly cheap to make it worthwhile. Short term trends sometimes give this ratio, or even better negative electricity pricing when wind turbines produce more power than the grid demands, but this is for very unusual and short periods of time, which means not very much energy is cycled through the system. A megawatt sized electrolyzer system is expensive, and it’s hard to pay off those capital costs when you’re not selling very many megawatt-hours of electricity. It’s worth more to sell the hydrogen directly, as its value is much higher than mixed methane-hydrogen, and some sources quote a sale price for hydrogen fuel of as high as $9/kg. But this is contrary to the original idea of storing hydrogen into the natural gas system. Note that, at industrial scale, hydrogen is frequently generated by reforming natural gas rather than electrolysis for cost reasons. Hydrogen injection is limited to much less than 200 TWh. 300 kW demonstration projects can easily be handled, but in the long term the gas network will become saturated. For example, in 2010 Germany consumed 83 billion cubic meters of gas every year. 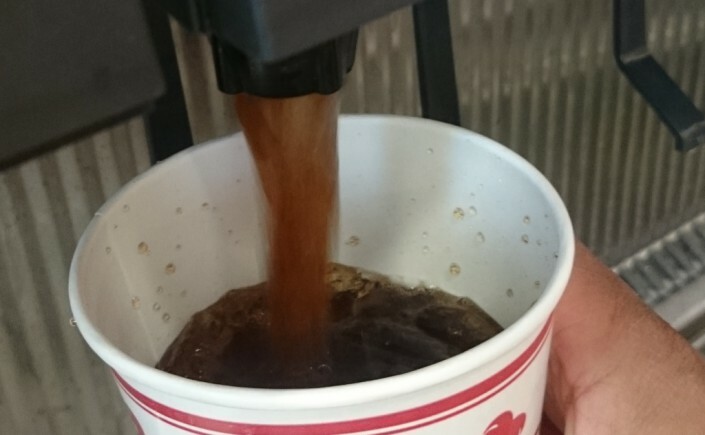 Think of this as the flow of carbonated water at the soda machine. If 2% of that was replaced by hydrogen (“syrup”), that stream would be saturated by a continuous electrolyzer power of only 890 MW electricity – a small fraction of Germany’s wind power capacity of 27,000 MW. An ITM presentation suggests that low electricity prices are available 30% of the year (30% capacity factor for 890 MW electrolyzers), totalling 2.3 TWh of electricity stored per year. So the energy stored is very large, but the power (rate) absorbed is low. What about this 200 TWh figure occasionally mentioned? It’s quoted widely and is based on Germany’s total natural gas storage reserves (mainly underground reservoirs owned by various private companies). That exact total capacity is 217 TWh of chemical heating energy of gas, which equals only 130 TWh of electricity after it is burned in a power plant. If 2% of that is replaced with hydrogen, then about 1.6 TWh of hydrogen chemical energy can be stored in the cavern (assuming the same 98%-2% volumetric ratio at the underground pressures). So be aware that the full quantity can only be used if natural gas is being stored, not methane-hydrogen mix. 1.6 TWh is a still huge quantity of energy storage, when you consider that a pumped-hydro dam and reservoir is only up to 0.05 TWh. But the reserve is like a huge bottle of carbonated water. Once enough syrup has been injectedto turn it all into Coca-Cola, that mix has to be drained out, before more syrup can be added. And the German consumption rate is 83 billion cubic meters per year, which limits the rate of energy refill to the 890 MW calculated earlier. To continue the metaphor, the reserve is a large bottle with a very small straw. Even permitting a 10X increase to 20% hydrogen would not keep up with a significant excess of wind power. (A very good NREL report says that 5%-15% H2 in natural gas might be possible without significant modification of end-use equipment). Is the long run methanation? To overcome these issues, hydrogen can be processed in a chemical plant and converted into methane. This “methanation” process has the great advantage of producing a storable gas that really can be filled up to 200 TWh in the natural gas reserve. There have been a number of studies and a few pilot plants – this report by RWE is a good one. The drawback is another significant efficiency hit in the conversion from H2 to CH4 (80% at best), and the capital cost for that additional chemical plant. This also doesn’t directly produce electricity – to do that takes another efficiency hit from a natural gas turbine, producing a very inefficient chain with a round-trip efficiency of somewhere between 17% to 40%. Electricity that has been run through this cycle is estimated at a rather expensive 0.50 Euro/kWh in the RWE study. Batteries would be much more efficient for round-trip storage of electricity (90%), though they can’t scale as easily as power-to-gas. For that reason of scalability, power-to-gas remains an attractive idea, and few other technologies can match it. An endgame where renewable energy is converted into synthetic natural gas produces a convenient energy storage form that does not require a massive infrastructure overhaul like hydrogen would, but the low efficiency of the chain and high cost remain serious issues. Until then, the current stepping stone of mixing hydrogen into methane is a useful step, but so small it is limited to 890 MW – a fraction of the surplus wind energy that can be expected in the future. For good reference papers, see this report by DNV Kema and this presentation by RWE. Thanks to Jim Oswald of Oswald Consulting Ltd. and an anonymous reviewer for their useful and insightful comments. Any errors are the author’s.